This Jigsaw Puzzle is dedicated to game of Football. This Jigsaw Puzzle contains the picture of many footballs. One square piece is taken out from this picture. You are given four choices which contains this missing pieces. You will need good concentration and observational skills to solve this Jigsaw Puzzle correctly in your first attempt. 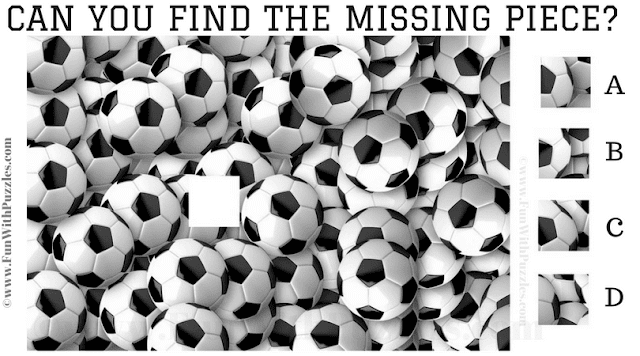 Let's see if you can find the missing piece in this Football Jigsaw Puzzle? Can you find the missing Jigsaw Piece? Answer of this "Football Jigsaw Puzzle", can be viewed by clicking on button. Please do give your best try before looking at the answer.